He loses about two or three miles per hour on his fastball with men on base, I noticed that on the radar. But that’s typical. That’s not unusual at all. As to whether that’s unusual, we’ve covered that previously. But was Feller right about Strasburg? Maybe so. 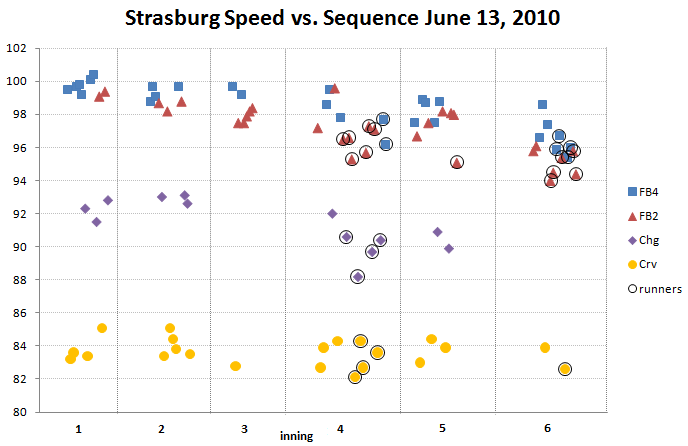 Here are the speeds of each of the pitches thrown by Strasburg on June 13, shown in sequence and broken out by pitch type. The pitches thrown with runners on base are circled. Strasburg went to his two-seam sinking fastball more often with men on base, and that pitch is slower than his four-seam fastball. But even accounting for the difference in pitch types, there does seem to be a drop of a couple mph with runners on base. So was he taking off speed for more command? RZ, that’s a good question. Short answer: I don’t know. This is his fastball location for that game Sunday with the black circles with runners on and red circles with the bases empty. He faced a lot of lefties that game so he may have just been placing it outside but those were well placed fastball on the edge of the plate.